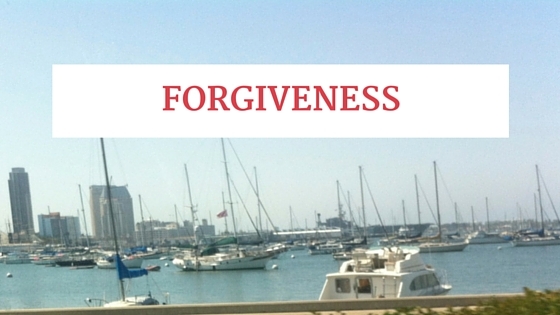 Why should you forgive someone for what they have done, or for what they haven't done? Why should you just let them off the hook for treating you the way that they did? Isn't that like giving them a free pass? Why should I forgive someone and make it that easy for them, when they have made it so difficult for me?! First we need to start with the definition of forgiveness. Note how the first two definitions start with "to stop feeling anger"
Yes you are angry, yes what happened was hurtful, but when you hold onto that...YOU are the person who feels the pain. YOU are the person who continues to hurt, not them! I am not saying you should just not feel the anger, because you should. Acknowledge it, know it, feel it, but not for too long. It is okay to be mad, but you gotta let it go... It's for your own happiness. I love the last definition, "to stop requiring payment of..." Wow think about that in the sense of you forgiving that person who did you wrong. When you forgive them, you can stop requiring payment from them, the payment that you will probably never receive. Maybe that payment is an apology, and once you can accept the apology that you may/will never receive, you will be free. Here's the next excuse I hear....and boy do I LOATHE excuses! It's the principle, they should apologize because it's the right thing to do. Pardon my abbreviations, but seriously. First of all, your 'right and wrong' obviously don't match up with the other person's 'right or wrong' or you wouldn't be in this position in the first place. So in order for you to make that person see that they are 'wrong' you would have to change that person... again, good luck with that! So in speaking of principle, when it comes to your life and your happiness and your beliefs, how would you rather spend your time? 2. Releasing the anger you feel toward them, by forgiving them. Which in turn would change YOUR life and increase your happiness principle. Choose to forgive. Do it for you. Give yourself the chance to breathe. Set yourself up for happiness. Whether you forget, or choose to remember, forgiveness comes first!